Does anyone have knowledge or insight on what happens to a dogs heart rate that is bloating? 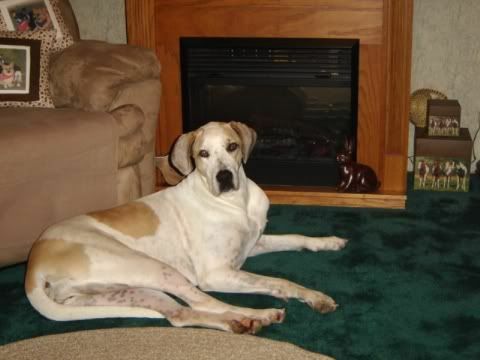 Like everyone here I am crazy obsessed with my Great Dane (3 1/2 yr old, male named Tyson). I recently found out a friend of his died of bloat in the middle of the night. Her death was just another reminder of the dreaded bloat . I’m currently looking in to purchasing a heart monitor collar for Tyson. I know a heart monitor obviously can’t prevent bloat BUT I’m thinking that a sudden spike or drop in heart rate could notify me that something is majorly wrong with Tyson. If I were to get a notice that his heart rate has risen or dropped drastically I can check my home camera to observe his behavior. It could be his heart rate spiked bc he saw a skateboarder pass by or there was a knock on the door; if so, my home camera can easily verify that. However if his vitals change drastically and my camera shows he’s exhibiting signs of bloat my theory/hope is that I can get home quickly to get him to the ER ASAP and can catch his bloating as quickly as possible to increase his chance of survival. To sum this all up I am asking for insight/knowledge. Does a dogs heart rate change significantly at the beginning stages of bloat? Is my idea crazy? Tyson is very well tempered and pretty lazy haha. During the day he sleeps (I know this from checking on him with my camera occasionally), so if he’s vitals change significantly, my non veterinarian mind says he’s either barking bc someone knocked on the door OR there is something physically wrong with him; either way the app will alert me of the notable change in heart rate. I haven’t seen any stats online regarding heart rate and the beginning stages of bloat. If anyone has knowledge of the above I’d really appreciate your comments. I’d also like to hear other owners thoughts on my idea. Am I a genius (haha), dumb, ridiculous, etc.? i would expect an increased heart rate with bloat since it's a very painful condition. in early bloat, there are some subtle signs (change in behavior). as for a monitor for daily use, i think with bloat symptoms being as obvious as they are (for the most part), your first signs would be the usual air licking, drooling, pacing, general discomfort, frantically trying to eat grass, etc. if you notice those things or even a couple of them, your first concern would be to head to the vet immediately unless they resolve in a few minutes. i know it's easy for me to say since i've had danes for 10+ years but try to relax and enjoy tyson! and take the precautions to make bloat less likely (rest an hour before and after meals, if he's extra thirsty from running and playing, don't let him gorge on water). i keep a stethoscope handy and i know what all of my dogs' normal vitals are so if i see any odd behavior, i listen to the heart that way. i have 3 pet cameras in my little house so i can log in any time i'm away and watch my 4 danes sleep. haha! i'm retired so i'm not gone much at all. i swear, my dogs can hear my van from a mile away because if i log in to a camera, i can see them standing at the door waiting for me.